Thai language has 44 letters, 32 vowels, 4 tone marks and various other symbols for pronunciation. This is the whole 44 Thai letters. Number under each letter tells you what class it is. middle class  high class and  low class. I found this photo in the internet. I am sorry I don’t remember which website. Hi! I’m new in this lenguage! I’m Chilean and I can speak English and a little Japanese, and now I wanna learn Thai, and I found this web site… and I love it. First, what do you recommend me to do… learn the alphabet first or learn some vocabulary? and why the consonant have 3 levels_… the pronuntiation changes depending of each level? Sawatdee ka Chilean, thank you for visiting my site. I am happy to hear that you found my lessons useful in your Thai learning. 1) If you don’t have a need to speak the language right away, it is a good start to learn the alphabets first. 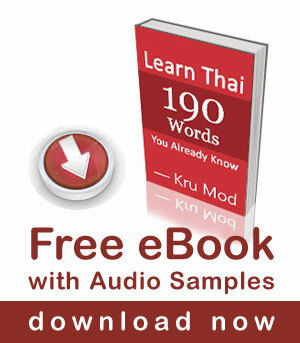 It will help you to understand Thai sounds and that will help with your pronunciation. 2) Thai alphabets are divided in to three classes because they have different tone rules. The tone changes depending on the class of the consonant. Hi Mod, I just started to learn thai alphabet but still confused, I can speak little in thai but learning the alphabet make me confused. Can you help me? Sawatdee ka Lia, apologies for the delay in my response. My computer was in the repair shop for 3 months. We are happy to help you learn Thai. Please write us at adjima_t@hotmail.com to schedule a free trial lesson. How can I right words in Thai? In creating thai words, is it letter by letter or we need to follow rules in making one. Its confusing me. Hello? I am a Filipino and I am fond of learning Languages. I know how to speak Japanese a little and now I want to learn Thai too. I find it very difficult to learn Thai language. I can’t seem to get it especially their script it’s so hard to familiar and all the tone. Haha I want to be a Thai speaker someday. I am a Filipino and I want to be a singer and actor in thailand.I am now starting to learn thai words but I don’t know how to write and read thai…Can You Help Me??? Please write us at adjima_t@hotmail.com to discuss about your lessons. Ok I will message you in your email. I am from America and I came to Thailand about 6 months ago and I’m supposed to be in school but I need help learning how to read and write thai. Apologies for the delay in my response. My computer was broken and in the repair shop for almost three months. We are happy to help you learn to read and write Thai. Please write us at adjima_t@hotmail.com We offer a free trial lesson so we can find out what you would like to achieve and how we can work best together. Look forward to hearing form you. I feel so frustrated Mod. I can not make any sense if thai words. I speak three languages and trying russian as forth, but thai is so difficult. I can not make sense of words. Helppppp!! !am going to ChiangMai and Bangkok next year!!! Sawatdii ka, I heard that Russian language was very difficult. Hai I want to learn Thai .but I am searching thai alphabet .its not showing properly in converted English .so please how I can learn please sugest me. really? lol free lessons in addition to all the free videos? Do you work for free? May I asked why it is that reading (more towards reciting)the vowels by the first grade Thai pupils, they are reading it in the following way ie. I understand that the first syllable กอ ko to read out the “k” syllable and the last syllable กึ ku when ึ is added to the ก consonant. Why reciting the pair of consonant+vowel the อ had to be spelled out also. Hi Charlie, apologies for the delay in my response. I tried to answer your question a couple of times before but I don’t know my website didn’t let it go through. I am sorry I don’t know why we have to read it with “อ” sound. Hi Mod, I wanna ask about the consonants, above you stating there are three consonants class, is there any conditions when the consonants used each for middle, high or low? for example one class used for name? !…or it’s just to differentiate the pronunciation (for the tones) ? I’m confused learning Thai because of the tones, gender identity and [for example] there are many P in Thai’s alphabets 🙂 I just confused when it used? or it will be give different meaning if you put different letter? and what your suggestion? learn the dictionary first or the alphabets^^. Ah i want to learn how to write in thai is there any easy way on how to learn? Can you explain to me how to create a word in thai. The most basic word in Thai is created by one consonant and one vowel. For example, put together the consonant “ก” which has ‘g’ sound and the vowel “า” which gives ‘aa’ sound then you get the word “กา” /gaa/ which means crow. Then when you want different tones , a tone mark is added. Mam my name is Muhammad Muzammal Majeed. Plz translate into thai. how can i read thai? Is it easy to learn! Hi Mod!!. In thai alphabet there’s a lot of kh in low class. How can I determine if what kh should I use in writing??. Sawatdee ka p’Mod can u send me thai vowels, so tha I can pratices write it and read it and learn to communicate. Hi Mod, can i check if 2consonants have been obsolete and today only 42 consonants being use now aday? Its very RUDE to SPAM another persons Language Site and your link is BEING SPAMMED EVERYWHERE. Shame on you. Mod has taken the time to offer free tools for learning the Thai Language and you come here hawking your over priced poo. I want to learn Thai on beginning. I am staying in Hong Kong most of the time and is there any Thai class in Hong Kong? Thanks for your kind assistance! Sawatdee ka Edward, we also teach one-to-one Thai lessons via Skype. We have been teaching students from around the World ; America, Europe, Australia, Asia over the years. From our experience we find that Skype lessons are as effective as in-person lessons. We always prefer meeting the student for a complimentary lesson to find out what the student wishes to achieve and how we can best work together. Thanks Mod for this and all the other useful resources in this section. I have learned to read Thai script but my one frustration is to be able to read modern Thai script that one finds on billboards and advertising for example. I can’t find a site that has the traditional and modern script side by side. Do you know of such a site? Or could you even prepare a lexicon with both scripts next to each other. Thanks again. Great site! Sawatdee ka p’Mod, I just wanted to know that, is it necessary to memorize all 44 consonants? Or do I just memorize the ones you just showed in your Thai alphabet video? I am Edward and I really have nothing to say about the post I am replying to…but wish to convey my appreciation for all the obvious hard work you two Gentle-Ladies have done over the years. I am a resident, long vacation, of Thailand and have attended a few classes but I like you 2 ladies best. I will move to Bkk just to be next to you… just kidding… I live in Hua Hin and Nakhon Sawan. OK now that I have sweetened you up… Do you have any videos explaining all the consonants and their different sounds regarding syllable position? And also the little symobols such as ma-ek and mai toe. Thanks ladies … I love you. I want to learn to how to speak thailand,how to write in thailand and how to understand the letters in thailand! I know how to pronounce the thai letters but I can’t read. Hehehe! i am sure i would learn to read alot quicker if you were to set vowels and letters up much the same as your 190 words e book. This was a very helpful Thai Script Chart. I am new at writing Thai. I found this most helpful due to Tones added in number context. Is it possible for you to cover all the letters above? i mean like how to say it with a brief example for each of them as well. I didn’t notice the English letters below the Thai alphabets at all. I am sorry this confuse you. Thai alphabets can be used as  first consonant and  final consonant. For example จ /jor jaan/ as a first consonant it give “j” sound, and as a final consonant it gives “d” sound like ด /.dor dek/. I need to remove this picture and replace with more clear explanation. Once again please accept my apology. ก /gor-gai/ as a first consonant has ‘g’ sound like in the English word ‘gun’, and as the final consonant it gives ‘k’ sound. ด /dor dek/ is ‘d’ sound for both first and final consonant. The chart follows IPA (International Phonetic Alphabet) rules. ก is written as K (an unaspirated K sound, pronounced like in the English word “scratch”). ข is written as Kh (an aspirated K sound, pronounced like in the English word “cat”). An example: The Thai city Khon Kaen – ขอนแก่น. The English would transliterate the name of this city like Kon Gaen. So it depends which transliteration system you use. I prefer IPA because the rules are international and comprehensible for people from all over the world, not only for native English speakers. I am not a native English speaker and the way English people transliterate Thai text looks and sounds a bit strange to me. You are correct about English translation. I am English speaking and Thai translation often looks strange to me. My translator on my computer does not always choose the correct word that is intended for the statement and it sometimes make the entire statement hard to understand. Hi! Mod..i am just curious if i going to learn thai….which that you recommend?to learn speak or learn to write is easier? Maybe you should learn English first. when is the next blog? can i learn how to read and write thai? Can i see the vowels?